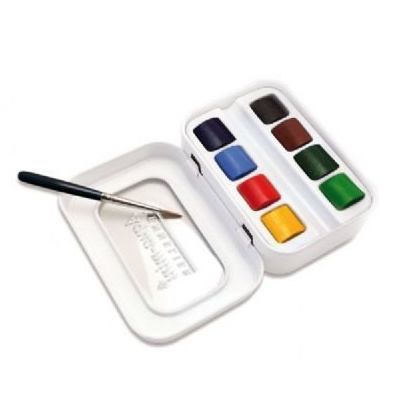 The 8 color half pan travel watercolor set from Sennelier is a fantastic deal on on great watercolors. Getting 8 half pans for less than $20 is a steal, so this set is well worth the asking price, with a few caveats and work you’ll have to do to make the set useable. The colors included are fantastic and useful for just about any urban sketching adventure. Unlike less well planned sets, this one includes the ever useful Payne’s Grey rather than black. The other colors are: primary yellow, French vermillion, cinereous blue, French ultramarine, pthalo green light, sap green, burnt umber. These colors have their limits. Obviously there is no cool or true red, so there is no mixing a decent purple, but overall it is a very useful set of colors. First the big issue is that the tin and insert that the colors are packed in is not quite useless but really not great. The insert is made of flimsy white plastic that I cannot imagine would stand up to much use. It’s not bad, and it might last the life of the pans, it’s just not all that useful. Using the colors in it means the plastic moves around quite a bit. Annoying. To fix this issue I moved my half pans from the flimsy insert to Schminke empty half pans**. Useful. The tin the set is housed in also has a few issues. First the lid has that cute little viewing window, which makes the lid, normally used to mix paints on, useless for that task. You could go about painting it or cutting a piece of Yupo to fit*. But that is way more work than it is worth and it won’t sit flat for mixing, so color ends up under the Yupo. . The next issue is that the tin is about ¼ inch deeper than most mint tins. This makes fitting a brush in a little more work. I abandoned the tin and placed my pans of color into a new tin. I’m using a Thayer’s lozenge tin- it’s square, fits my hand well, and is just deep enough to hold the pans well. I use a little ball of plastic tack to hold each pan in place. It works well, and allows me to pick and chose what colors I’d like to include in my tin for that outing. Sennelier watercolors are a great choice for someone looking for good watercolors that wet easily. Some people dislike them and others love them. I’m a fan of them for their good colors, relative affordability, frequent sales, and amazing rewetting; simply touching a wet brush to the pan results in a decent load of color. For roughly $18, getting 8 half pans is a steal. Oh, it comes with a tiny little joke of a brush. It holds a point well but it would really only be useful for working on something smaller than an ATC or ACEO. The handle is far too short to be useful. If you can figure out a useful way of extending it, let me know in the comments. This entry was posted in Review and tagged half pans, journal, pans, review, sennelier, sketchbook, sketching, urban, waer color, watercolor on 20150723 by leslie.